West Limerick Resources is a community development organisation working to achieve positive change in the lives of people and groups in West Limerick. 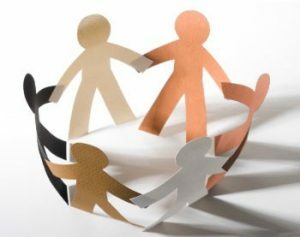 Our efforts are directed at building a stronger community through the enhancement of personal and community identity, values, places, structure and services. West Limerick Resources is committed to the community. Our goal is to effect sustainable improvement in the factors – rural, urban and social – that contribute to disadvantage in West Limerick. Since our establishment in 1993, we have administered over €18 million in development funds which have been used to support to a wide variety of projects varying from education supports, to community enhancement projects to enterprise development with all offering a valuable contribution to the identity, values and strength of the community. 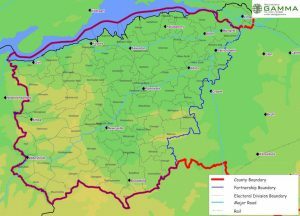 West Limerick Resources covers a catchment area of approximately 520 square miles in the west of county Limerick with a population of 64, 586 (2006 Census). Did you start your business through the Back to Work Enterprise Scheme? The LDC Enterprise Awards will celebrate the achievements and contributions of individuals moving from unemployment to self-employment by successfully establishing their own business via the Back to Work or Short Term Enterprise Allowance Scheme. Closing date for receipt of applications is 5pm on Wednesday 20th March 2019. 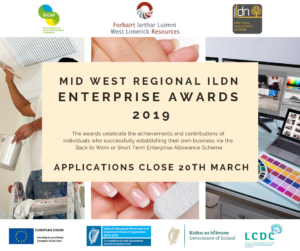 The Mid West regional winners will be announced at an awards event to be held in April and will then go forward to the National LDC Enterprise Awards final to be held on Thursday evening 16th May 2019 in the Tullamore Court Hotel. 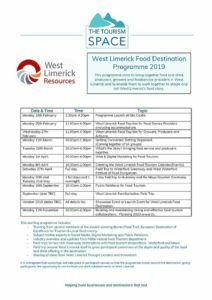 WLR are delighted to announce the launch of the West Limerick Food Destination Programme 2019. For anyone who hasn’t signed up yet, you are still most welcome to attend the programme and we hope you can join us for the remainder. Attached is the Programme schedule showing key dates from now until November 2019. 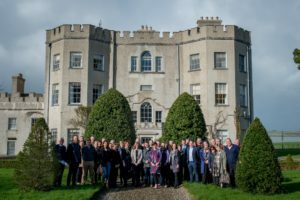 Wednesday 27th February, 11am-4pm, Longcourt Hotel, Newcastlewest – West Limerick Food Tourism for Growers, Producers and Artisans. 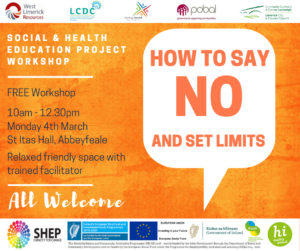 PLEASE NOTE: These are parallel workshops, meaning that you go to one or the other. 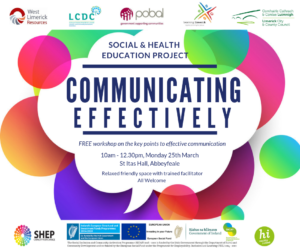 If you are in foodservice or accommodation, attend the workshop on Monday 25th. If you are a grower or producer, attend the workshop on Wednesday 27th. However, we are flexible – the important thing is that you come along on one of the days. 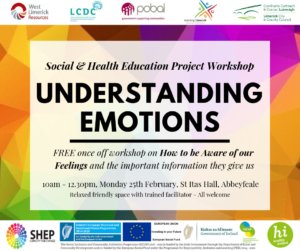 West Limerick Resources in conjunction with the Social and Health Education Project (SHEP) and Healthy Ireland/Healthy Limerick are running a short series of FREE workshops that offer you the the chance to get to know yourself better in a supportive, friendly, non-judgemental environment. How to be aware of our feelings and use them for the important information they give us. How to say “no” and set limits. 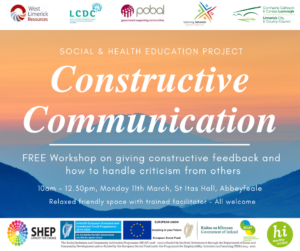 Giving constructive feedback and how to handle criticism from others. Join our mailing list to get the latest news from West Limerick Resources.